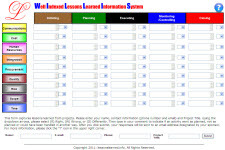 Click here to see an example of a web-based LLR. Monitoring/controlling activities are also captured. Knowledge areas are captured across the process groups. The users name email and phone number are captured by the form. When the contributor clicks submit, the record is sent to a designated email address, i.e., SharePoint administrator who can store lessons. A macro can also be set up to automatically import lessons into a knowledge management system. This process of automating and simplifying the capture of lessons ensures success.